Below are some of the best core exercises and some of the favorite exercises for building core strength from Personal Trainer and owner of the website My-Personal-Trainer-School.com David Bohmiller. This is a serious core exercise, not designed for beginners or the faint of heart. In addition to challenging the stability of the arms and hips, it really increases the demand on the abdominal muscles. Remember, core exercises are exercises that do not simply target the abs, but also focus on challenging balance and increasing the stability of the hips, shoulders, and spine. This core exercise is so great because it works all of the major core muscles in the hips, shoulders, and spine. Here's some tips to let you know if you're ready for this exercise. #1 You should be able to do a complete set of 10 or more push ups. #2 You should be able to hold the regular plank for more than 60 seconds. 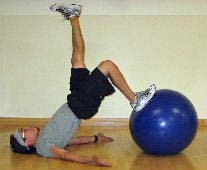 #3 You should be able to do 15 repetitions of the stability ball roll-ins. #4 You should have no pain or major injuries to your wrist, shoulder, hip or lower back. 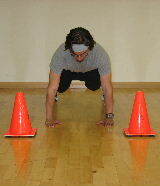 If you are a serious athlete, training for sports this core exercise can improve your speed and agility. Starting Position: Begin by placing your feet on the ball from the push up position. Keep your body in a straight line, and pull in your abs to stabilize your spine. Form: Use your abs to hold your core in a straight line, and bring in your right knee towards your right elbow. Then, repeat on the left side. Move in an alternating fashion, and attempt to complete 4-10 repetitions per leg. Personal Training Tips: Remember to keep you abs engaged so that your back does not arch. Master the basics before attempting more challenging exercises for building core strength. This core exercise focuses on increasing lower back and hip stability, and it works the hamstrings (back of the thigh) and glutes (hips). 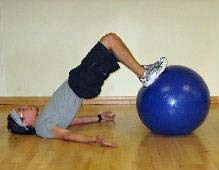 Starting Position: Begin by placing both feet on the stability ball. Push through your heel and bridge up until your body is in a straight line. Form: Maintain the bridge position throughout this exercise. While stabilizing with your right leg, straighten your left leg. Pause for 1 second before replacing your left foot back on the ball. Repeat on the other side. Attempt 4-10 repetitions on each leg. Personal Training Tips: If you find this exercise for building core strength is too challenging on the ball, you can regress this core exercise and make it easier by performing it on the floor or with your foot on a step. Your body should not move throughout the set. Your back should be still and solid, and only your legs should move. You may really feel the muscles in the back of your thigh tightening (maybe almost to cramping). If you feel, the tendency towards cramping try an easier version of the exercise. This variation of the plank increases the muscle work on the shoulder stabilizer muscles. 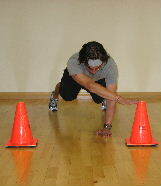 Starting Position: Set up 2 cones (or any target) slightly wider than shoulder's width. Begin in the plank push up position, by balancing on your hands and toes. Keep your hands under your shoulders and keep your feet about hip width apart. 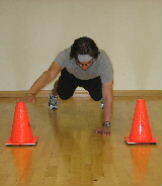 Form: Start with your right hand, reach for the top of the cone that is on your right side. Tap the top and pause for 1 second. Then, reach with your right hand for the cone that is on your left side. Tap the top and pause for 1 second, before returning to the plank push up position. Repeat on the left side. Attempt 4-10 repetitions per arm. Personal Training Tips: Remember to engage your abs and keep your belly button pulled in towards your spine. To make this exercise harder bring your feet closer together. Before trying these advanced exercises for building core strength, master the basics. I'd like to say a special thank you to my friend and colleague David Bohmiller for his contribution to the page. Boh (as his friends call him) has built a successful personal training business, and one of his passions is teaching others trainers the principles of elite personal trainers.